One of America's most popular music artists shares beautiful pieces of an unforgettable human mosaic, revealing pieces of a life in progress. 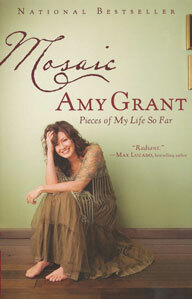 With her unmistakable voice and honest lyrics, Amy Grant has captured a unique place in American music. As the bestselling Christian music artist of all time, a crossover pop sensation, and the wife of country music star Vince Gill, Amy has lived much of her life in the spotlight, subject to adulation, speculation, and scrutiny. Now for the first time she bares her heart and soul to reveal thoughts on everything from motherhood and marriage to fame and forgiveness. Whether describing personal moments alone on a moonlit hillside or very public ones performing with the likes of Tony Bennett and James Taylor, Amy presents a captivating collection of beautiful reflections on life, love, and faith.